WARWICK, U.K. — April 17, 2017 — Square Box Systems, the company behind the industry-leading CatDV media asset management (MAM) system, today announced several powerful new enhancements for Worker 7, the company’s next-generation workflow automation solution for CatDV deployments. Worker 7 has full support for Linux environments as well as OS X® and Windows platforms, and now includes features for easing CatDV’s deployment in high-performance, cloud-based workflows, and native transcoding and proxy generation from virtually every common media and camera format. CatDV Worker 7 is a general-purpose automation engine that enables users to build customized workflows and automate file processing. Worker 7 is highly configurable, with the ability to automate functions such as content ingest, proxy creation, transcoding (including control of external transcoders), content movement and archiving, and file renaming. As such, Worker offers a powerful tool for users to streamline a wide variety of media workflow logistics tasks. A few examples include copying content securely from camera cards to a SAN or NAS, automatically ingesting assets into CatDV, sending emails to a logger to tag content, performing transcoding to create a Web proxy, and archiving to partner LTO solutions. 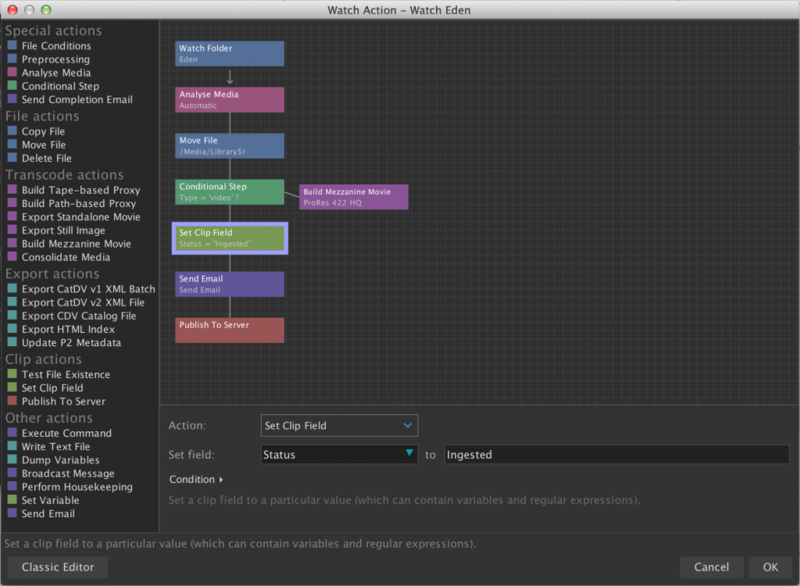 In the latest set of enhancements, Worker 7 includes an all-new graphical workflow designer, giving operators an “at-a-glance” visual overview of the processing steps in a workflow definition. By clicking and dragging options into the flow-chart-style view, operators can manage the workflow more holistically and better understand the impact of each dependency. In addition to its full support for Linux environments, Worker 7 is based on CatDV’s latest core engine, giving users access to improved metadata extraction and transcoding support. With the forthcoming new ‘Tin Man’ player from Calibrated, this means Worker 7 now supports native transcoding and proxy generation from almost all common media and camera formats, including XDCAM, P2, Avid, XAVC, XF, RED, AVCHD, DPX, ARRI, and others. Other new Worker 7 enhancements include the ability to run as a background service that starts automatically when the computer starts up, rather than requiring a desktop login session, and for larger organisations, the option for an intuitive dashboard for operators to remotely monitor multiple Worker 7 services running on different machines.